Understanding the transmembrane potential (TMP) dynamics of the heart provides an essential guidance to the diagnoses and treatment of cardiac arrhythmias. Most existing methods analyze and classify the TMP signal globally depending on extracting silent features such as the activation time. In consequence, these methods can not characterize the dysfunctions of each cardiac cell dynamically. 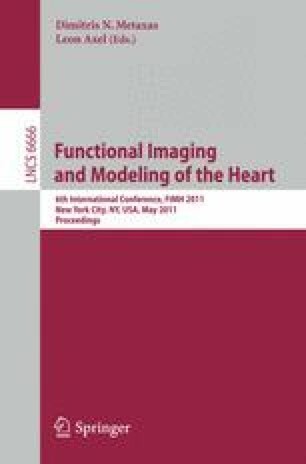 In order to assess the electrophysiology of the heart considering pathological conditions of each cardiac cell over time, one should analyze and classify the TMP behavior that is differentially expressed in a particular set of time. In this paper, we utilize a spectral co-clustering algorithm to disclose the abnormality of the TMP dynamics over a time sequence. This algorithm is based on the observation that the embedding spectrum structures in the TMP dynamics matrices can be found in their eigenvectors through singular value decomposition (SVD). These eigenvectors correspond to the characteristic patterns across cardiac cells or time sequence. To demonstrate the reliability of this approach, our experimental results show great agreement with the ground truth of the simulated data sets that enable efficient use of this scheme for revealing abnormal behavior in TMP dynamics, at the presence of added Gaussian noise to the simulated TMP dynamics. Furthermore, we compare our results against the k-means clustering algorithm outcomes.